CAPP-Tipton Dental Academy has launched the Restorative & Aesthetic Dentistry Certificate and Diploma courses in Dubai, UAE. Group 1 & 2 started in September 2016, Group 3 started on 05 October 2017, Group 4 started on 04 October 2018. Group 5 will be starting on 19 September 2019. 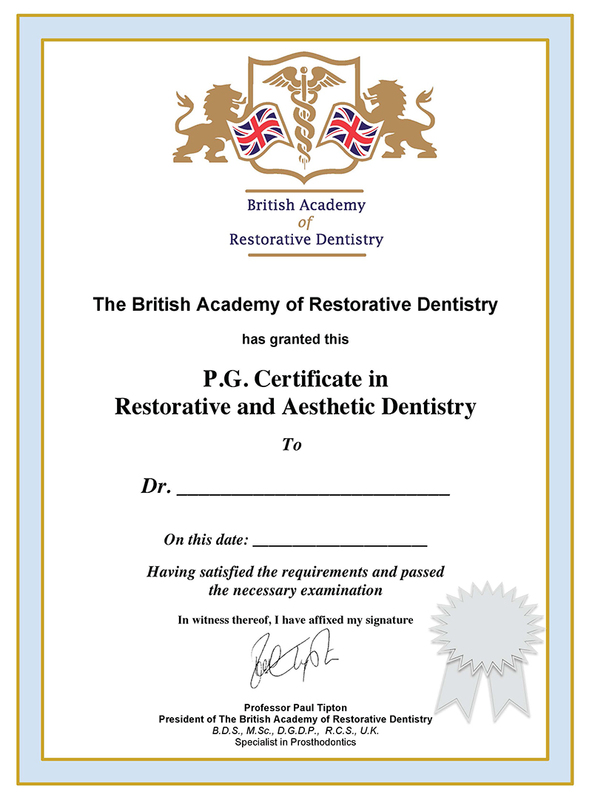 Year 1 (Certificate) is spread over 4 Modules (15 days in total) and it offers the participants a chance to obtain a Certificate in Restorative Dentistry (PG Cert Rest Dent) from the British Academy of Restorative Dentistry (BARD). 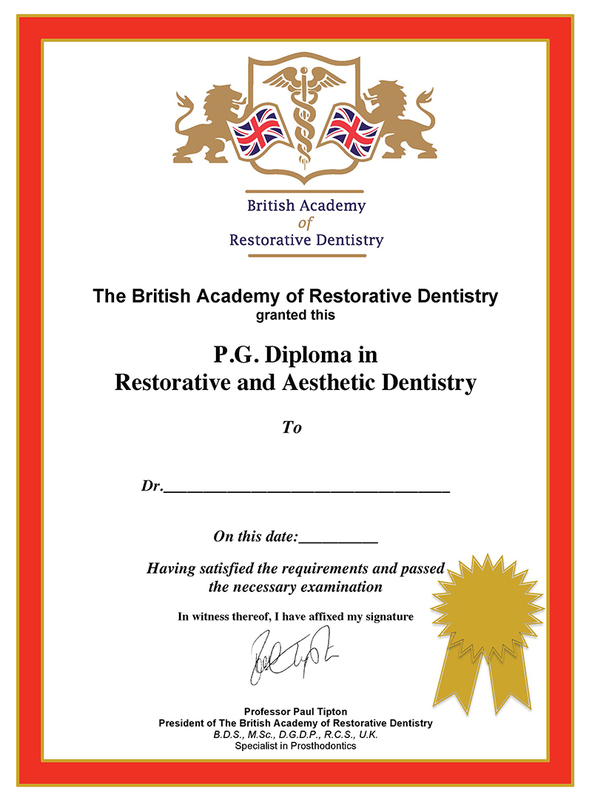 After a successful completion of the Year 1 Certificate course, the participants will have the chance to sign up for Year 2 Diploma (4 Modules, 15 days in total) which will lead to Post-graduate Diploma in Restorative & Aesthetic Dentistry from the British Academy of Restorative Dentistry (BARD). The courses will comprise of lectures, practicals (hands-on training on phantom heads) and seminars. After completion of the Diploma, there is an option for delegates to take the pathway to MSc (Masters of Science) in Restorative and Aesthetic Dentistry with The University of Manchester and Healthcare Learning OR Masters in Clinical Dentistry (MClinDent) Restorative and Cosmetic Dentistry with City of London Dental School (CoLDS). CAPP-Tipton Dental Academy and the British Academy of Restorative Dentistry (BARD) also offer in Dubai, UAE Clinical Endodontics Diploma and Clinical Implantology Diploma programmes. There are over 240 delegates completed and currently participating in the 3 Diploma programmes. In addition, CAPP in cooperation with Aachen Dental Laser Center (AALZ) and RWTH International Academy - RWTH Aachen University offer Lasers in Dentistry Mastership programme. To teach you how to put scientifically proven cutting-edge restorative and aesthetic techniques into practice to deliver great results. Give you confidence to take on more significant restorative cases. Help ease your transition into private practice. CAPP-Tipton Dental Academy aims to increase levels of confidence and self-belief in the delegates and to teach them excellence in dental techniques so that they can achieve their career ambitions. CAPP-Tipton Dental Academy provides access to specialist guest speakers to ensure that the participants receive the most advanced knowledge available. Increase your income - Up-skill now and give yourself the opportunity to generate more income. Performing just one extra treatment a month could mean that the course pays for itself! Improve your job prospects - Secure a better, more varied job. Gain the confidence to open your own private practice and stop referring high-value work elsewhere. Boost your confidence - Our lecturers will teach you proven techniques to improve the quality of your results, reduce your failure rate and, increase your confidence to take on more complex work.